This week the Italian airwaves are filled with remembrances of 9/11, or undici settembre. My memories, too, have an Italian perspective. I was here when it happened—in Gavi, doing a final scout for our Piedmont bike tour scheduled to start the next day. We wrapped up around 3 p.m. and stopped in the hotel to make sure our reservations were in order. I walked into the lounge. Several German guests were riveted to the television. I walked over and saw my hometown in flames. The World Trade Center towers were both spewing smoke and fire. No one knew exactly what was going on, so we stared, dumbfounded and mute, waiting for some explanation. Then the first tower started to pancake. During those initial slow-motion seconds, I was certain it would stop at the floor where the plane had penetrated. But it didn’t. The entire tower buckled downward, and New York was changed forever. We all gasped. I wanted to point and shout “That’s my home!” but I swallowed my words. I was in Europe, where George Bush Jr. was widely ridiculed as a gun-slinging cowboy. I wasn’t in the mood for a political debate, so I kept my thoughts to myself and focused on the screen. People in the second tower then started to jump. They don’t show those video clips anymore, but the memory is indelible. People on the ground later said the sound of bodies crashing was louder than you’d ever imagine, like grand pianos thrown from the sky. Air traffic across the U.S. was frozen, so we got on the phone and tried to contact our guests. Some were sitting on the runway when the towers fell. None made it to Italy. Two bikers from Switzerland managed to arrive by train, however, so we ran our tour anyway. It was surreal. The weather was splendid—perfect for biking, with crisp air, bright light, and cerulean blue skies. The countryside was gorgeous and the grapes ripe for harvest. Biking the Langhe hills was as exhilarating as always. But I’d catch myself feeling that this was wrong: feeling good and proceeding with life as normal. Word about my hometown quickly fell out of the news and was replaced by reports on Al Qaeda and plans for retaliation. But I hungered for word from New York. Over the next few weeks, I gleaned bits and pieces from friends’ sporadic emails. They talked about their bronchitis and lung problems, the vigils and handmade Have You Seen…? signs, the friends downtown who’d been force-evacuated from their homes, the depression that settled over the city, thick as the WTC’s white dust. One client left me a copy of New Yorkmagazine which I devoured, only to regret reading a report about the exodus of people from the city—fright flight. The young, the creative, the energetic were fleeing my beloved New York and relocating elsewhere. It was just too depressing. But fear was everywhere. Thirty percent of our clients cancelled their tours that fall, afraid to fly. 2003 was worse still, as the pending Gulf War kept travelers at home, waiting for the other shoe to drop. When I returned to New York in November, the first thing I did was head to Ground Zero. 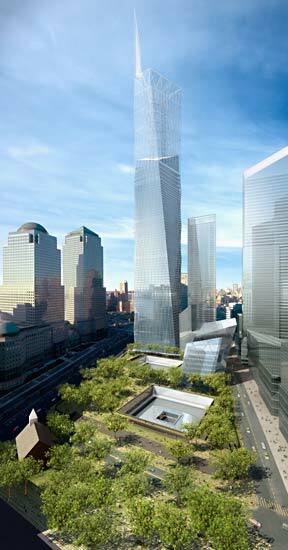 I walked to a barricade and saw a section of the WTC towering above me, the metal veneer twisted like a rag in a tornado. Smoke was emanating from piles of rubble—subterranean electrical fires, still burning after two months. It was a punch in the gut. The twin towers had been my navigation point, my southern star, since arriving in Manhattan twenty years earlier. I saw them every morning from the F train and always felt a shimmer of pride and satisfaction at the sight. This is New York! they seemed to proclaim. This is New York and you live here!No other skyline was like it. Now it was gone, as were thousands of lives. I stood looking, fixed in place, taking in the horrible sight and the acrid smell as office workers streamed by me, heading home at the end of the day. Tears streamed down my face. I cried openly. Just then, like a NYC storybook, a group of firemen appeared. They were leaving the WTC work site at the end of their shift and walking in my direction. One saw my wet face and came over, He placed his hand on my shoulder and said, “It’ll be all right,” then walked on. Ten years have passed. Next month, I return again from Italy to a whole different site. During the past year, the reflecting pools have been built, the trees planted, and a tower at long last is rising. I’m waiting for it to grow to its full height, waiting for that gaping cavity in the skyline to be filled once again. Maybe then it'll be all right. But meantime, I know where I'm going as soon as I return home.